A brief look at the development and operation of Chinese standard gauge steam locomotives from the first railways built in the late 19th Century, through the turbulent first half of the 20th Century and the rapid development of railways following the Liberation to the twilight of steam operation in the early 21st Century. China has a national numbering system for standard gauge locomotives, irrespective of whether they work on the national system, on local railways or industrial lines. The principal difficulty for western observers is that the class designation is often written in Chinese characters which many enthusiasts find difficult to read and are tempted to ignore. This article covers the origins of the origins of the numbering system, its structure and how to differentiate between classes. 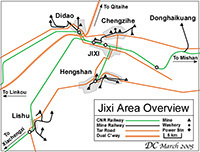 Detailed profiles of 16 classes of Chinese standard gauge steam locomotives including all those in the main line or industrial service during the last two decades. These include historical and technical details and photographs. Illustrated profiles of a number of diesel classes, imported and indigenous, diesel-electric and diesel-hydraulic, main line and industrial, past and present, with technical details, history and notes on use. The Locomotive List project is an attempt to record the location and ownership of every standard gauge locomotive in China since the opening up of the country to foreign visitors in the mid 1970s. Although the task can never realistically be completed, the lists now contain information on over 7000 locomotives of 59 classes from 1976 to the present day, arranged by class and by location. Sketch maps of various Chinese steam locations past and present.